Tried and true recipes, new twists on old favorites, and new dishes to expand my family's palate. One of my most favorite ways to eat chicken. I only make it several times a year, but when I do it never lasts long. I’m also on a lemon and lime kick lately. This works for that craving because Chicken Francese is all about the lemon. I’m all about tweaking recipes and making them all your own. But when it comes to Chicken Francese, the simplest way is the best. I’ve seen people take the basic, simple recipe and tweak it to areas that no longer resemble the original dish. They will add diced onion, parmesan cheese, garlic, and basil. And that’s fine. I tweak many a recipe from the original version. But for me and my family, we like the authentic flavor of this dish. The dominant flavor in this dish is the lemon, and I don’t like it compromised by any other strong flavor like garlic or onion. But if you truly do have the need to tweak it, have at it. It’s simple enough that you can work it to make it whatever works for you. Just don’t skimp on the lemon! Trim chicken breasts of any fat. Take each breast and flatten it out with a mallet. If the breasts are very thick, you will want to filet them before pounding them out thin. I had four thick breasts, which I had to filet and then pound out thin. Set the chicken to the side and then prepare your work station for dipping and flouring. Crack the eggs into a shallow bowl and beat together well. You can add a teaspoon of cool water to the eggs to help thin them out a bit. In a separate shallow bowl add your flour and season with your salt and pepper. Stir to combine. Dip each chicken breast first in the flour, then the egg, and then the flour again, pressing to make sure you get a nice even coat. Set each breast on a plate until you finish dipping and breading each one. Set the oven to 350 degrees. In a non-stick skillet, add 2 tablespoons of olive oil and set the heat to medium. Once hot, add two chicken breasts at a time and cook until just done on each side. You want them to be a very light golden brown. We are not looking for a deep brown color to these. Cook each breast until just about done. Remove to a casserole dish and continue browning each chicken breast, continuing to add oil 2 tablespoons at a time as needed. Once you are done, place the casserole dish with the chicken in the oven uncovered and allow to cook for 10 – 12 minutes. Meanwhile wipe out the skillet with some paper towels. You don’t want to clean the pan completely, but you do want to remove all that flour that has browned in the bottom. You won’t remove the flavor by doing this, but you will allow yourself to have a nice lemon colored sauce. Set burner to medium heat and pour in your chicken broth. Add some salt and pepper if you feel it needs it. Squeeze in the juice of two lemons. Bring to a boil and then quickly whisk in about 1 teaspoon of flour. Add in the 3 tablespoons of butter and whisk again. Turn the heat down to simmer and allow to reduce to almost half. Once the sauce is done, add the chopped fresh parsley and stir. Set the chicken breasts out on a rimmed platter or baking dish, and pour the sauce all over the top of each breast. Take your last lemon and slice it thin, with the skin on. Place pieces of sliced lemon across the whole dish and serve. Note: If you are using 4 thin chicken breasts, even before pounding them thin, you will serve about 4 with this dish. If you are using 4 thick cut breasts like I used, you should filet them into 8 breasts and then pound each thin. Thanks for visiting, Gabriella. Love your name! I’m a big fan of Greek food, along with anything containing lemons. I will check out your site! Looks great! 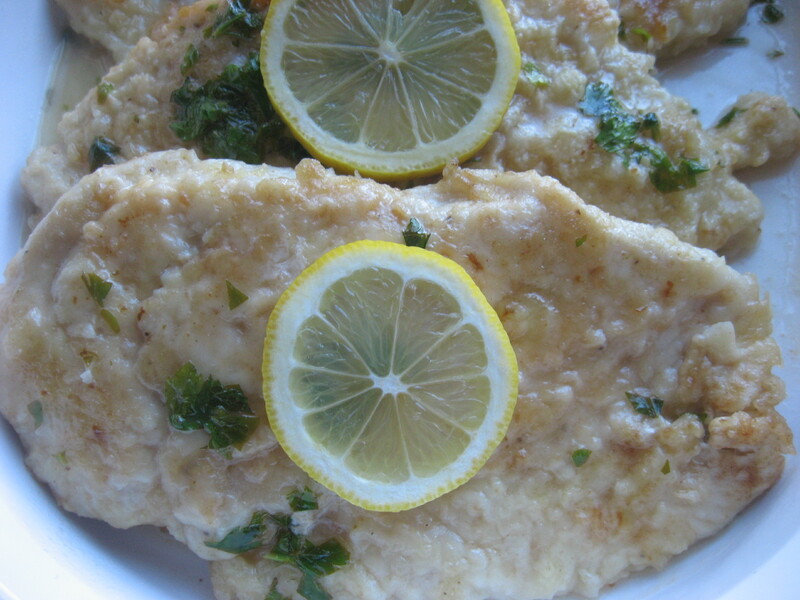 I am a big fan of Chicken Francese….that and a huge pile of white rice and I am good to go. Great final picture too!! I love white rice on the side of this as well. 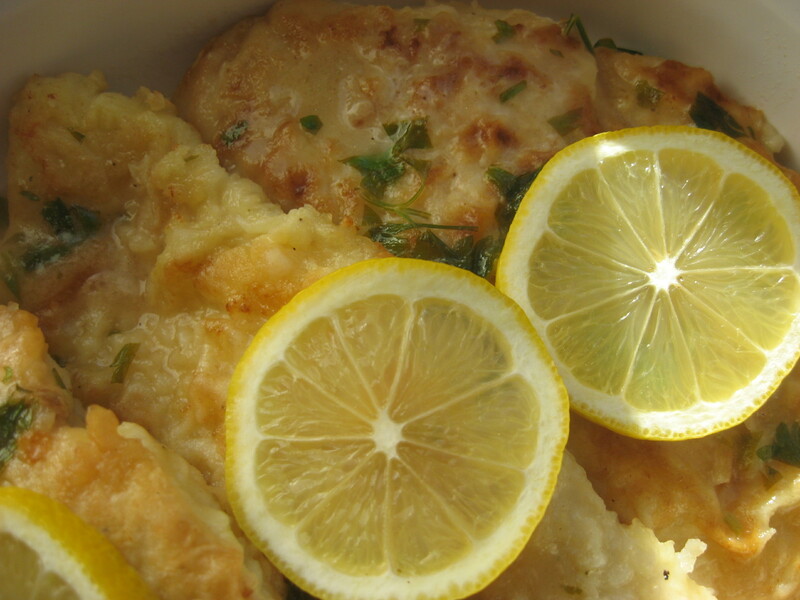 I almost always choose Chicken Francese whenever it’s an option at a party, wedding, etc. I love it! i will have to try this, we have a francese recipe from the local Shwartz guy which is good but just not it, you know what i mean? I am a former sous chef and casually cook for me and my girlfriend all the time. Chicken francese is one of our all time favorites and ive made it many different ways using different recipes. I am actually going to make it now seeing that i have the ingredients at home, just a quick question though, i dont have any lemons so will lemon juice be an alright substitute for YOUR recipe, because i know it works just fine with other reciipes, i know unfortunetly i wont be able to use it at the end for garnish…and also i see that your recipe doesnt use any cooking wine at all, i was just wondering how come you dont use it in yours? thats it just those two questions.. Thanks for stopping by. For the first question, yes you can use lemon juice in the recipe. Fresh lemon is always best, but there have been many times that I have used lemon juice because that is just what I had on hand. As I mentioned, I tend to love the lemon flavor in this dish, so I will always add extra but some of my family members prefer less lemon. All just a matter of taste. I’ve never added wine to my dish because the few recipes I tried with white wine in them took away from the flavor that I have always known Chicken Francese to have. I order it often when I’m out (we live in New York) and I’ve never had it with a wine taste. Chicken Picatta yes, but not Chicken Francese. I’ve tried it with just white wine and no chicken broth and the wine was too overpowering. I’ve tried it with a mixture of both and it still was not that authentic francese taste I was used to. I make my Chicken Picatta with wine and capers, but I felt that the wine was too overpowering for this dish. But, that being said, you have to go with what you like best. I’ve changed many recipes and found I liked them better the way I tweaked them from their original version. Let me know how it works for you. Is there a way that I can make it ahead and reheat. I am having a party and will need enough for 10 and I don’t want to be in the kitchen cooking Could I half cook the chicken, put in fridge and make sauce. Keep sauce in the pan, bake the chicken then reheat the sauce and pour over the chicken. @ Carly. Did you cook it ahead of time? And if so how did it come out? I am having a party and want to do the same.